The Wave is one of Kat and Ana's microgames in WarioWare: Twisted! and one of Wario Deluxe's microgames in WarioWare Gold. 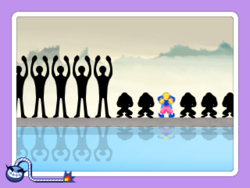 The player controls a pink kangaroo in WarioWare: Twisted! and Wario in WarioWare Gold. The game's purpose is to make stand or squat. They must do this at the right time with the other people. If the player fails to do so, they lose. 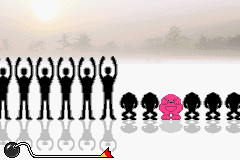 1st level difficulty: The player has to stand. 2nd level difficulty: The player has to squat, though they have less time to react. 3rd level difficulty: The player has to stand then squat, also with not much time to react. This page was last edited on December 6, 2018, at 15:58.